The neural crest is a remarkable multipotent cell population that has become a model system for how epithelial cells become mesenchymal and migrate during development. In today’s post, we feature a paper from the recent issue of The Journal of Cell Biology that investigates the role that proteolysis of cell-cell adhesion receptors plays in this process. 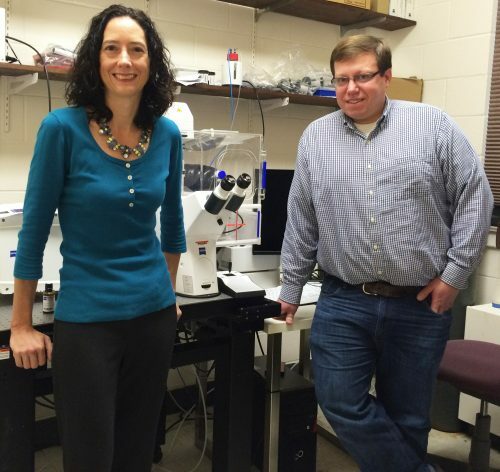 We caught up with first author and postdoc Andrew Schiffmacher, and his advisor Lisa Taneyhill, Associate Professor in the Department of Animal and Avian Sciences at the University of Maryland. So Lisa, can you tell us your scientific biography and what questions your lab is interested in? LT Well, I did not start out as a developmental biologist, but am sure glad I ended up as one! On the contrary, I was trained as a cancer biologist working with cultured cells in Dr. Arnie Levine’s lab at Princeton, from where I received my Ph.D. But what I lacked at the time was experience in a live animal model. My interest in developmental biology truly blossomed while a postdoc in the lab of Dr. Marianne Bronner at Caltech. Here Marianne’s enthusiasm for development, and the chick embryo as a model, was truly infectious. I fell in love with developmental biology and soon realized that I could couple my interest in cancer, and in particular metastasis, with development by looking at how neural crest cells form and migrate. In 2007, I started my own lab at the University of Maryland, where we use both the chick embryo and cell culture to ask questions related to embryo development. In my lab, we aim to elucidate how cells interact and communicate to form new tissues, and specifically, the fine balance that exists between dismantling and assembling cellular junctions to generate migratory cells and mediate intercellular interactions, respectively. We are investigating these processes by examining the cranial neural crest cell epithelial-to-mesenchymal transition, or EMT, and the formation of the cranial ganglia, which occurs through interactions between two different migratory cell types, cranial neural crest and placode cell-derived sensory neurons. And Andy, how did you come to join the Taneyhill lab? I was a doctoral student in Dr. Carol Keefer’s lab investigating gene networks that are responsible for maintaining pluripotency and directing lineage segregation in early mammalian embryos. Due to limited embryo resources, most of my thesis work entailed the use of cell lines as models for this stage of development. While I became highly interested in stem cell biology and the achievements being made (IPS cell technology came out around this time), I was far more interested in studying stemness and developmental potential within the context of embryonic development. Lisa’s new research program revealed to me the most fascinating cell type- the neural crest cell. As a cell biologist, I knew there were so many fundamental questions that could be addressed by studying neural crest development. In addition, Lisa was an obvious choice as a mentor as she was very successful and strong in areas where I knew I needed improvement. Transverse section through midbrain expressing CTF2-HA, from Fig. 3, Schiffmacher, et al. 2016 JCB. What are the benefits of chicken embryos as a model to study EMT? LT The chick is a phenomenal developmental model because of the ability to conduct in ovo/in vivo and ex vivo assays with the neural crest. So one can look at the impact of gene perturbation on EMT in either an embryo section or in a cell culture dish containing neural crest cells dissected out of the embryo. This inherent experimental flexibility lends itself to both fixed and live cell imaging experiments. There is a also wealth of historical literature on chick neural crest development that can help drive our studies. AS Chick cranial neural crest EMT occurs en masse at a very specific time in development, which allows us to perform genetic perturbations at specific times pre-EMT, and then evaluate effects during EMT. The biochemistry experiments I needed to perform to address our questions in vivo required harvesting sufficient amounts of tissue. With the chick, I could electroporate DNA or morpholinos into many embryos at one sitting and collect tissue after a short post-incubation time. The chick model offers the convenience of setting up large, synchronized experiments and does not require an animal facility. What was known about the roles of Cadherins in EMT prior to your current paper? LT Dating from my work in Marianne’s lab, we knew that a reduction of at least one cadherin in the chick head, Cad6B, was critical for neural crest cells to undergo EMT and migrate, as perturbation of Cad6B impacts these processes. 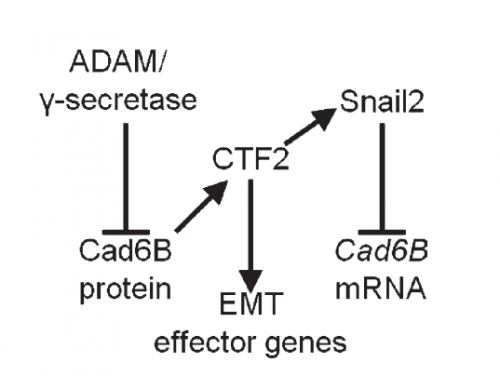 Initial results revealed that loss of Cad6B transcripts occurred through the activity of the transcription factor Snail2 directly repressing Cad6B transcription during EMT. Work from other postdocs in Marianne’s lab, such as Pablo Strobl-Mazzulla and Crystal Rogers, refined this mechanism and also began uncovering roles for N-cadherin and E-cadherin during EMT, respectively. But it became very clear that transcriptional repression of cadherins was not the only way to modulate cadherin levels during EMT. My lab showed that Cad6B protein is internalized by both clathrin-mediated endocytosis and macropinocytosis during cranial neural crest EMT, which further reduces membrane Cad6B. Chaya Kalcheim’s lab also published a paper almost 10 years ago now that described how the proteolysis of N-cadherin was important to permit chick trunk neural crest cells to undergo EMT and migrate. And Dom Alfandari, Jubin Kashef, and others have published many studies revealing how Cadherin-11 proteolysis in Xenopus cranial neural crest is key for migration. Andy’s studies on Cad6B proteolysis during EMT follow on from these. AS Our work published in MBOC was definitively inspired by Chaya Kalcheim, Dom Alfandari, and Jubin Kashef’s research and essentially established that cadherins expressed in chick cranial neural crest cells undergoing EMT are also regulated by proteolysis. Our goal was to identify and validate the proteases involved and assess their importance as regulators of EMT. Our next goal was to figure out what the cleaved Cad6B byproducts were doing. Fortunately for us there is an enormous wealth of information on Cadherin biology and proteolysis that helped steer our experiments in the right direction. I like to think our JCB manuscript pays tribute to all of that work. Can you sum up the key results from your paper in a paragraph? AS We found that prior to and during EMT, Cad6B levels are regulated by ADAM and γ-secretase proteases, and as a result, N-terminal and C-terminal Cad6B fragments are being produced. Following cleavage by γ-secretase, the soluble C-terminal fragment or CTF2 remains associated with β-catenin. This complex protects both proteins from degradation, and allows them to accumulate. This leads to increased nuclear importation, where β-catenin can exert greater regulatory input into modulating EMT effector gene expression, most notably Snail2. Interestingly, we found that the Cad6B CTF2 is not merely along for the ride and separates from β-catenin upon nuclear import, but also co-associates with the chromatin. Regulatory circuit for neural crest EMT, from Fig. 6, Schiffmacher, et al. 2016. JCB. It seems like proteases are at the top of your EMT network. What regulates their levels and activities? LT It’s clear that precise control over these proteases is crucial to limit their activity to defined times during the development of a neural crest cell. Some of this is dictated by the spatiotemporal expression pattern of the proteases themselves, and we certainly see that for the ADAMs and γ-secretase. The other thing to bear in mind is that these proteases will likely process multiple substrates, so their presence in the neural crest is not solely to cleave cadherins. This adds another layer of complexity to trying to understand what modulates their levels and activities. The short answer is that we don’t yet know the upstream pathways regulating these proteases, but this is a question that is currently being addressed by my lab. And what is going on with the other Cadherins at the same time? Is there any crosstalk between them? LT We’re intrigued by this possibility, but it is a tricky question to address. Premigratory cranial neural crest cells express multiple cadherin proteins, but at specific developmental times, and it’s quite possible that other cadherins are expressed whose identity has yet to be discovered. Do you think the proteolysis-transcriptional regulation mechanism you have revealed will be involved in other developmental or pathological events? AS Most certainly. I would hypothesize it is occurring in any cell where cadherins and metalloproteinases are co-expressed, and especially when cadherin levels need to be under tight regulatory control, including events like EMT and migration. This mechanism also most likely contributes to epithelial carcinoma cell dissemination during metastatic progression in tumors. When doing the research, was there a particularly exciting result or eureka moment that has stayed with you? AS For the MBOC article, I was disheartened when we realized that CTF2 overexpression resulted in no dramatic neural crest cell migration phenotype. As part of that experiment, I happened to perform Cad6B co-immunohistochemistry as a premigratory neural crest marker. I’ll never forget sitting in my hotel room in Cancun, Mexico (SDB/ISDB meeting, 2013) staring at the images and then realizing that Cad6B levels were diminished in electroporated neural crest cells! This eureka moment was tied to the next one, where I decided to perform Snail2 quantitative PCR to determine if Snail2 levels were altered in order to explain why CTF2 overexpression downregulated full-length Cad6B. It was relieving to see that Snail2 levels were increased. And what about the flipside: any specific moments of frustration or despair? AS Nearly every Western blot was performed using hundreds of excised midbrain dorsal neural tubes for the collective treatments. One mistake and I would lose weeks/months worth of tissue electroporation/collection. On the bright side, I learned I work well under that kind of pressure. Finally Andy, what are your plans following this work? AS I am currently seeking a position as a principal investigator in academia, and would like to continue my research investigating how metalloproteinase-mediated proteolysis generates other substrate fragment-based regulatory inputs into a cell’s gene network during neural crest development. And Lisa, where next for the Taneyhill lab? LT:We aim to decipher how CTF2s provide transcriptional input into the neural crest gene regulatory network, and uncover additional targets in this process. We are also investigating potential functions associated with the Cad6B shed ectodomain. Finally, we are examining the molecules required to mediate cell-cell adhesion and interactions as the cranial ganglia assemble. All of these objectives lead to an overarching goal to understand how cells communicate with one another to allow for fundamental, and important, changes during vertebrate development, such as the generation of a migratory neural crest cell or a new tissue from multiple cell types. Browse the People Behind the Papers archive here.